Dried cane syrup, organic tapioca syrup, pectin, sodium citrate, natural raspberry fllavor with other natural flavors, citric acid, fractionated coconut oil (non-hydrogenated), beeswax. All the same immune system support benefits and great taste as the original Sambucus Gummies, now specially formulated for kids! 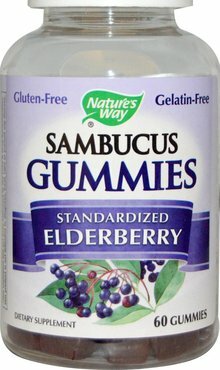 Made with Black elderberry extract standardized to BioActives (flavonoids), vitamin C, and zinc - and they taste great too! Our triple action immune blend, specially formulated for kids, includes elderberry, vitamin C, and zinc to help support the immune system. These great tasting gummies are sure to be a favorite! For centuries, the dark berries of the European black elder have been traditionally used as a winter remedy for immune support. More recently, a growing collection of research has found that the active constituents found in elderberries may provide even more health benefits. 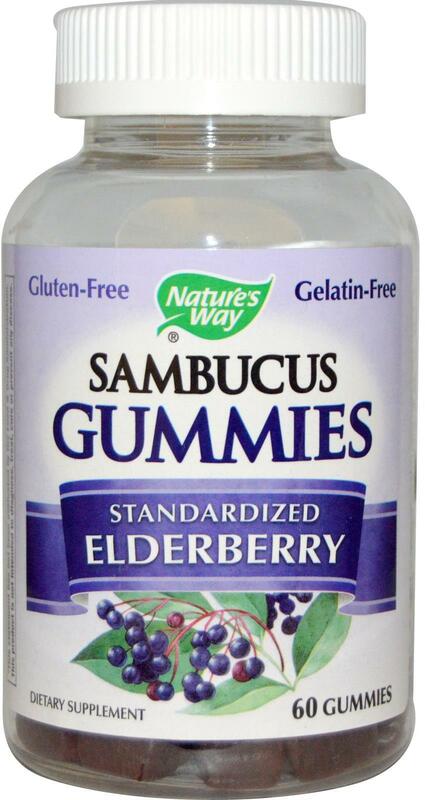 Nature's Way Sambucus is made from elderberries grown just as nature intended. From the foothills of the Styrian region of Austria, our elderberries are grown in nutrient-rich soil at an optimal altitude of 300-700 meters. With each and every elderberry tree tended by growers with generations of knowledge, we ensure that traditional wisdom shows us the way to better berries. -The Haschberg variety of elderberries, containing elevated levels of naturally-occurring anthocyanins, a key contributor to the health benefits associated with elderberries. -100% hand-picked and harvested for optimal ripeness. -Inspected for quality and frozen on the same day they are picked to ensure freshness. -Made into extract without any added chemicals, dyes, or solvents. GLUTEN FREE. Contain no gelatin, artificial flavors, or colors. Not for children under 2 years of age due to choking hazard. Children 2-3 years of age, chew 1 gummy daily. For children 4 years of age and older, chew 2 gummies daily. Instruct child to chew the gummies thoroughly before swallowing. Do not exceed the recommended daily dosage. If pregnant, nursing, or taking any medications, consult a healthcare professional before use. Keep out of reach of children. Safety sealed for your protection. Do not use if safety seal under child resistant bottlecap is broken or missing. Store at room temperature. Keep bottle tightly closed. Avoid excessive heat and direct sunlight.